Today's generation would never be the same without the influence of Jackie Chan, a martial artist from Hong Kong and has been acting since the 1960s and has appeared in more than 150 different genres of movies. He is known for his hilarious comedy and martial arts films wherein some of them are now considered "legendary" and "masterpieces". 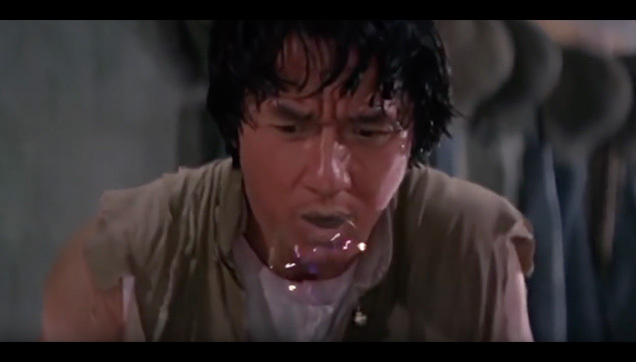 Jackie Chan, the Drunken Master while blowing out some bubbles in the movie. Even on the 21st Century and considering his age, he's still capable of doing fantastic and death-defying stunts as a martial artist. He didn't even need a body double to complete a hard routine for his films. Here are some of Jackie's best fight scenes from all of his movies.